This is the EXCLUSIVE PREMIUM mix of the most popular hardwoods used today. Just Hickory, Cherry, Hard Maple & Apple. No oak or alder filler. Making it great on short cooks and smooth smoke flavor on long smokes, not as heavy as all Hickory and not as light as Apple. A great everyday Premium Perfect Mix at a GREAT price! There is no lesser grade woods used! Just 100% top Hardwoods! 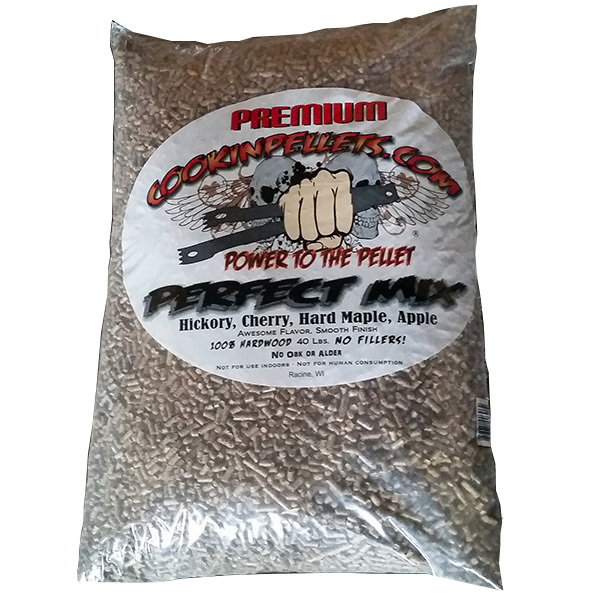 CookinPellets Perfect Mix Pellets adds a nice Smoke flavor any food. We use this as our everyday pellet. Just a great flavor. With no loss of flavor due to lesser grade woods as in other companies blends. 100% of what we say it is NO Filler. These Pellets are 100% of the wood named! There is no add filler or soft woods like others do. Some companies use 80% Oak or Alder, a cheaper filler wood mixed into the wood you are buying!